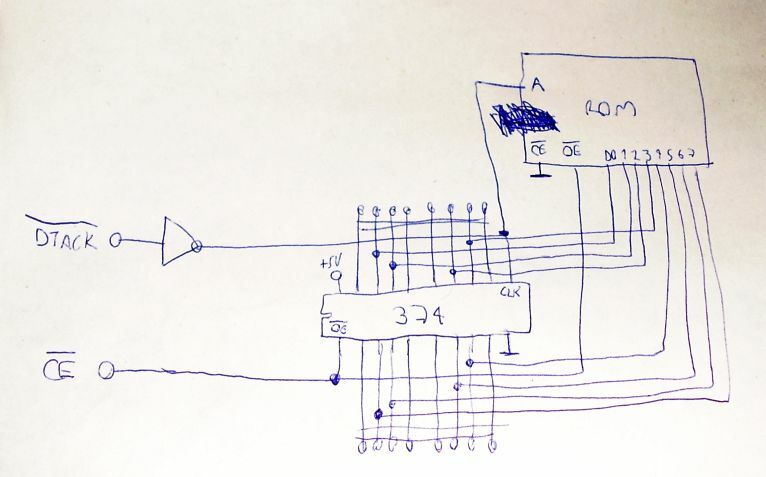 Recently I've found in this page a schematic of a MegaDrive game wich uses an 8bit ROM and a circuit to "convert" it to 16 bit. My doubt is: would this simply work out of the box or the pirate game was somehow altered to make this possible? I know that would be simple to just use 2 8bit ROMs with the odd/even bytes, but this circuit seems interesting, specially to me who only have a single 8bit ROM to try. Latching the upper and lower bytes on each access and assembling the 16-bit words before they get to the CPU isn't conceptually that different from the N64 RAM being only 9 bits wide and then the RCP memory controller reassembling words before the R4300i sees them. But you'd need a fairly fast ROM for this, and I remember reading somewhere that some early Genesis games couldn't DMA from ROM to VRAM because they were manufactured on slow ROM. Instead, they had to PIO-copy data to VRAM, as if it were a filthy Master System, or copy it to work RAM and then DMA it from there. But I don't see much point, particularly given that the larger 5.0 V EPROMs (27C160 and 27C322) are 16-bit anyway, to the point where people end up using multiplexer circuits to get a 27C322 working with the Super NES's 8-bit data bus. Or were 16-bit EPROMs not made in smaller capacities? Also I didn't know about the DMA, wich is interesting too. Sure! I agree with that too. But that's not a matter of getting new parts, but to try to (re)use the ones I have. Or were 16-bit EPROMs not made in smaller capacities? There were lots of them. The 27C400 and 27C800 were both 16-bit chips with 4Mbit and 8Mbit sizes, respectively. This is what is done in Turrican cartridge (seems to be same as the schematic earlier). It works but only on real original hardware that has no overclock or TMSS bypass mod done to it. It will not work on any clones except the superclones that use 1:1 copied parts. If you have to use 8bit ROMs use pair of them, it is guaranteed to work and allows you to save money on bulk ordering of the memory chips. The pictured schematic uses B21 / "/CAS2", which is "asserted for reads and writes within 000000-7FFFFF". I'm vaguely surprised that it's a useful amount of phase delay relative to the other signals to use as a demultiplexing clock. Were being the key word. There are no new 5V 16-bit ROMs, other than Atmel's expensive OTP offerings. The volume discount doesn't hit 50% though. The circuit works only because of the slight timing difference between various signals, there's some tens of ns between the edges.